These pictures were taken today. Yesterday I walked about 20 feet or so, back and forth along a set of parallel bars. 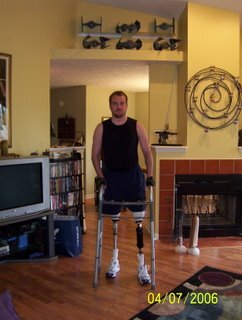 The left prostheses is not as comfortable as the right but, it does fit. 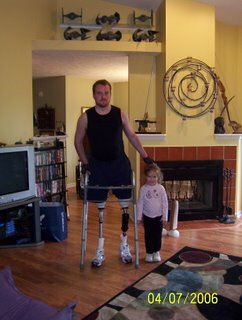 If you remember, I talked a few weeks ago about the extra bone growing at the end of my legs. 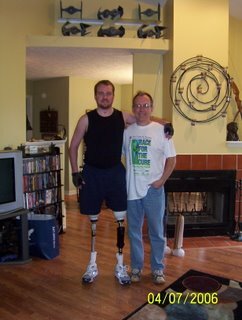 Well, when I first put on the right leg it was uncomfortable but after about three days my right leg shrank to a point that the prostheses now fits comfortably. We hope that the same will happen with the left. Today, when I put on the new leg, it was very painful. The pain is caused by the extra bone. Renee encouraged me to give it time and, as I worked with it, the pain lessened. It's still not comfortable, and there still may need to be some adjustments. 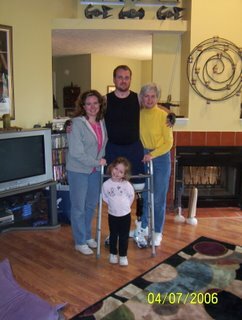 But, with Renee's help, and my determination, I was able to walk about 200 to 250 feet today. It is awkward and I have a long way to go before I can truly walk comfortably but yesterday and today were huge steps forward, and sideways, and backwards! I promise not to make you wait a week when events like this happen. After all, I wouldn't be here without all of you. Can't wait to hear your comments on the pictures! Have a great weekend! We asked a simple question and you answered in a manner that is amazingly powerful. The 20 feet yesterday and the ten-fold-plus journey today speaks volumes about your determination and perseverance and pure grit. You have clearly demonstrated that you are a much bigger man than a year ago, so go on and keep the extra height if you wish. We will help you with the longer pants. Truly amazing. That just about says it all for me - which, as you know, is really unusual. It's hard to find words...we are so happy to see the pictures of you standing but it cannot compare to what you must be feeling. You continue to be in our thoughts and prayers...you and your entire family. You look great! We are so glad Sarah sent us an email to share the news. We'll look forward to continuing to hear (and see) how its going. How Providential!! I have been enjoying listening to Merrilinda playing the piano this morning (she has been playing a lot more since we had it tuned last summer and getting better each day) and anyway I had just sung along quietly with "I Walked Today Where Jesus Walked", which is one of my favorites, and then I came up and got on the computer--which you probably have noticed I don't do very often. My intention was to renew our license plates on line, but then I thought first I will check Jeremy's blog. And there you are--WALKING!! Little does it matter what "they" predicted--you are on God's schedule and keeping on it with your own grit. Dave Craig (the Pacer's trainer) hasn't even met you and he says he's proud of you. WOW!!! What fantastic pictures, Jeremy! How awesome to see you walking! WOW! Thanks for posting the pictures. They are truly a joyful sight! Congratulations! What a feeling that must have been!! Hey, you haven't said much lately about your backside? Skinny little chicken legs! Now I can say without a doubut, "You've got skinny little chicken legs" but cook you up I can say there won't be much meat but pleaty of essential nutrients like...iron....steel....etc. RUNNING TALL,still surrounded by love. You are winning big and we are so happy for you. Nice pics, Jeremy - It's really exciting to see outside of parallel bars and cold hospital hallways! Now I'll be nervous all weekend to hear how it went (i.e. please don't fall!). Thanks for reminding me why I do this every day (insert emotional moment). For everyone reading comments, he walked a lot more than 250 feet, literally and figuratively. By the way, Jeremy, Delilah was not a nice person...! Hi Jeremy, You are just amazing! To do what you have done in such a short period of time is an absolute miracle. We are so proud of you. Keep up the outstanding work. We will have a steak on the grille at the lake waiting for you. See you soon. Congratulations! You are still taller than your Dad and have more hair!!! And I thought my weekends were filled with activites. That was a great way to start my Monday. Great pictures....is that upper body strength I see? Can't wait for the next update. Finally, having dinner with your friend and mine Dave on Wednesday would you care to join us? Keep up the great work Jeremy. Your courage and preseverance are truly amazing!!! Wow! I'm sure it has seemed like forever to you, but to the rest of us it seems like you are moving at lightning speed! You just keep running over all of these milestones faster then I ever could have imagined. How do you do it? Every week you seem to accomplish something that I assumed was still months down the road. We are truly in awe of your determination, hard work, attitude, and humor. Thanks for proving that people like you still exist. Thanks for posting the new pics, Germ! I'm so proud of you! Nothing that I write could express how those photos made me feel. I am absolutely floored by your determination! Please don't stop writing as your strength gives me encouragement that I may someday conquer obstacles in my own life. You are an inspiration to us all. Great pictures and we loved the "buns of steel" note! Maybe you should also take up writing. The note was both articulate and funny. Your determination is awesome - keep it up! Jeremy, I forgot to sign the previous note-sorry. It was from Kenyon & Paula. Just wanted to say how amazing!!!! The pictures brought tears to my eyes! Thank you to all those nurses and doctors you mentioned in your previous posting for helping get you to this point that, in the beginning, we weren't sure would be possible but with your determination and willpower you have overcome great obstacles. I know I've said it before but you are truly my hero!!! Whatever muscle you lost in your lower legs, you definitely made up in your arms. What are your career goals? Writer or WWF professional wrestler??? I HAD NOT BEEN ON IN A WEEK DUE TO COMPUTER ISSUES BUT MOM AND DAD HAVE BEEN KEEPING ME IN THE LOOP - - VIRGINIA BEACH COUSINS ARE BACK ON LINE AND SOOOOOO HAPPY FOR YOU. YOU LOOK JUST GREAT!! We're SO happy to see you looking so happy (and fit!) - we live on your block and moved here after you'd grown up and moved on...We've followed your story every week and we're so happy for you and your family for all that's transpired during these last 6 months. You should consider (once the PT schedule slacks off a bit) publishing some variant of this blog - it's truly amazing what you've been able to accomplish and you certainly have a gift for writing your thoughts. I love reading your blog as it's truly an inspiration. I will never forget the great memories we had while we worked at the Downtonwn Marriott and hope to hear from you soon. You look great, you have an amazing family and support group as well.